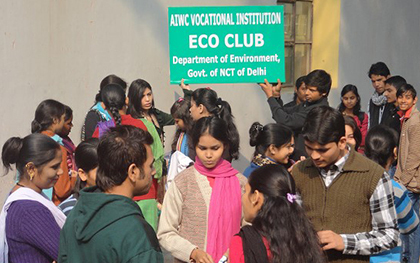 The AIWC Vocational Institute (AVI), has affiliation with the National Institute of Open Schooling (NIOS) and offers various certificate courses in computer science, beauty culture, textile block printing, cutting and tailoring to enable income generation and employability. AIWC also runs IGNOU study centres for courses such as BCA, MCA, CIT and MSW for which classes are held on weekends. All India Women’s Conference is a pioneer NGO working in the field of socio-economic development of women all over India since its inception in 1927. It has undertaken activities in the field of education, health, self-employment and employment orientated training programme. With its dedication to uplifting and betterment of women and children, it has initiated literacy campaign through non formal education for school dropout girls and literacy programme along with vocational training for adult women through its 530 branches all over India. AIWC is recognized the world over as a premier organization working for women’s development and empowerment. The institution is located in central Delhi and caters to students from all walks of life and aims to empower women and children through appropriate skill development leading to gainful employment. It provides short term vocational training programme to the underprivileged and marginalized youth and adults of the community. The vision of the institution is “learning for livelihood”. Keeping this in mind the institution aims to produce responsible, self-reliant and self sufficient students through self-employment and employment oriented skill based training. We are also privileged to be now a part of National Institute of Open Schooling, which is set up by the Ministry of Human Resource Development, Government of India, as an autonomous organisation. To meet the demand and supply of skilled manpower and enable the youth and underprivileged women to become financially self sufficient. The need of the hour is to develop the skill based education. NIOS offers vocational education programmes in addition to secondary and senior secondary level courses. AIWC IS NOW AN ACCREDITED VOCATIONAL INSTITUTION OF NIOS (AVI#990301).We offer following six months course offered by NIOS and some of our own in-house courses. Visit our institution at Sarojini House 6, Bhagwan Dass road, New Delhi - 110001, for further information. Education alone does not suffice in itself to make a person “whole”. Many other life skills are required to be successful in professional and personal life. We are committed to our students and have therefore included some special skills and personality development modules for the benefit of the students.